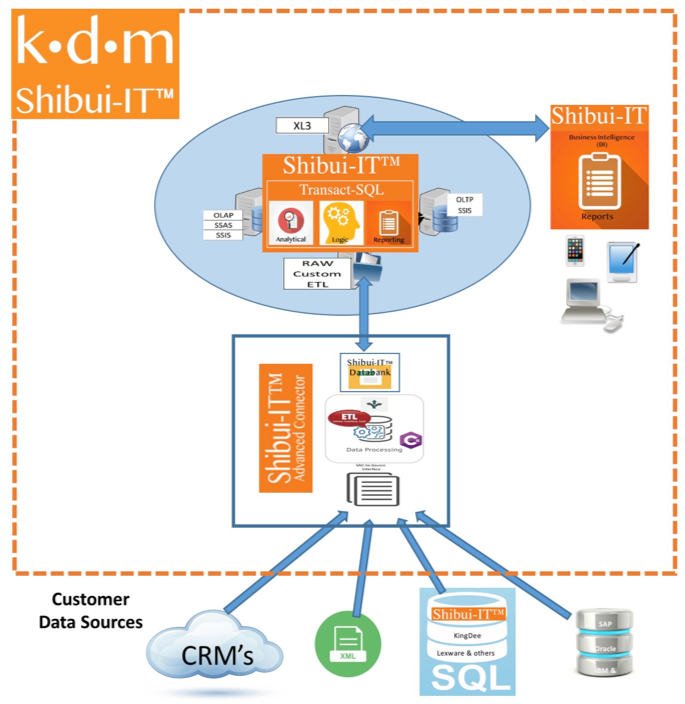 Shibui-IT™ is a Software tool that can extract, transfer and load any form of customer Enterprise Resource Planning (ERP) & Customer Relationship Management (CRM) data through the Shibui-IT™ Advanced Connector (SAC) into a Shibui-IT™ databank to create custom Business Intelligence (BI) reports anytime and anywhere. will help to better monitor the execution of the company’s product and service strategies with easy-to-use ad hoc available BI reports and replaces the manual and time/cost consuming once-only use analysis reports. links and integrates CRM data from SalesForce.com and Excel spreadsheets with supply chain and financial data from any common ERP data source. is available as a SaaS (Software as a Service) solution for On-Premise server or Cloud platform. Shibui-IT™ is an advanced analytics and forecasting BI suite that produces more accurate forecasts and pipelines to make sales planning a collaborative and effective addition to any Sales & Operations Planning (S&OP) process. Shibui-IT™ will create and deliver ad hoc and customized key performance indices (KPI) reports for business, operations and management reviews. k•d•m semi consulting commits a fast deployment and guarantees an immediate return of investment by increasing the companies profitability.